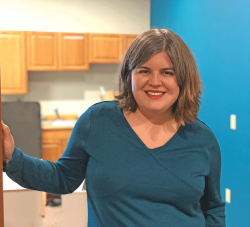 POTSDAM -- Anchorspace Potsdam, which a news release describes as “the first co-working space in the area,” will open to members and the public in January. Above is Nicole Ouellette, owner of Anchorspace Potsdam. The release says Anchorspace Potsdam was conceived when Nicole Ouellette tried to work in Potsdam this past February. Ouellette, who owns an online marketing company, also manages two other “co-working spaces” in Maine and was living in Maine the last two years while dating her Clarkson University boyfriend long distance. The final green light was financial. Ouellette had offered in-kind co-working space as part of a 2019 ANAC grant application with the St. Lawrence County Chamber of Commerce. “When the grant was awarded and my in-kind space was officially needed, I knew I had to take the plunge,” she said. The business’s website is anchorspacepotsdam.com.